It is a super reliable and powerful enough to start even a heavy-duty truck! However, the very first thing that you will notice is its design. It has the necessary elements only. It is quite large and heavy but that is not a big problem, since it has an ergonomic handle and you can take it wherever you need. The clamps can be attached to special spots and it makes the device easy to move. The case is made of a very strong material so you should not worry if you break it or damage somehow. 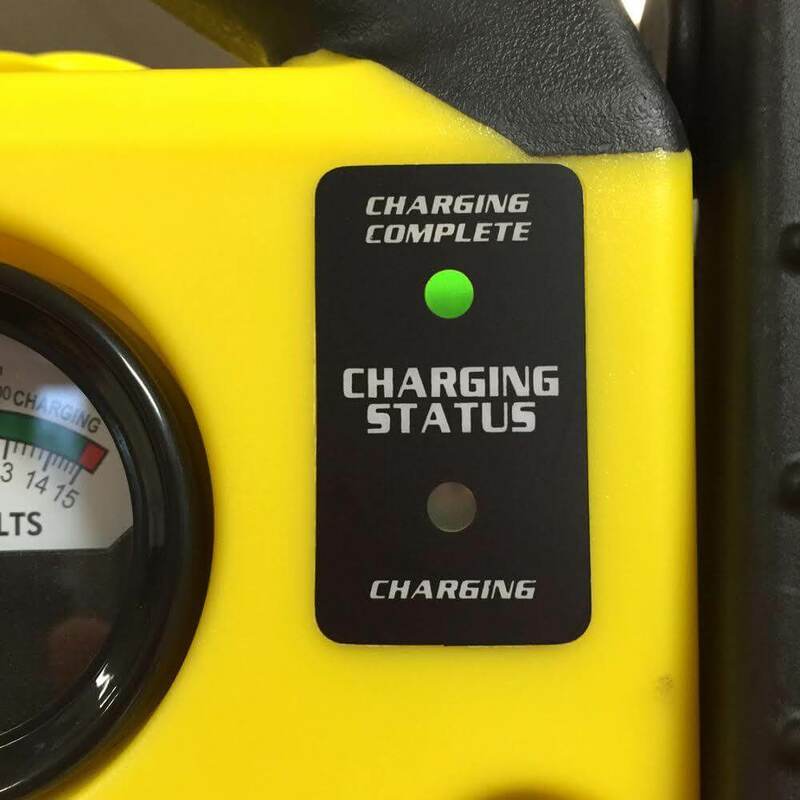 Another important feature of this starter is an air compressor. 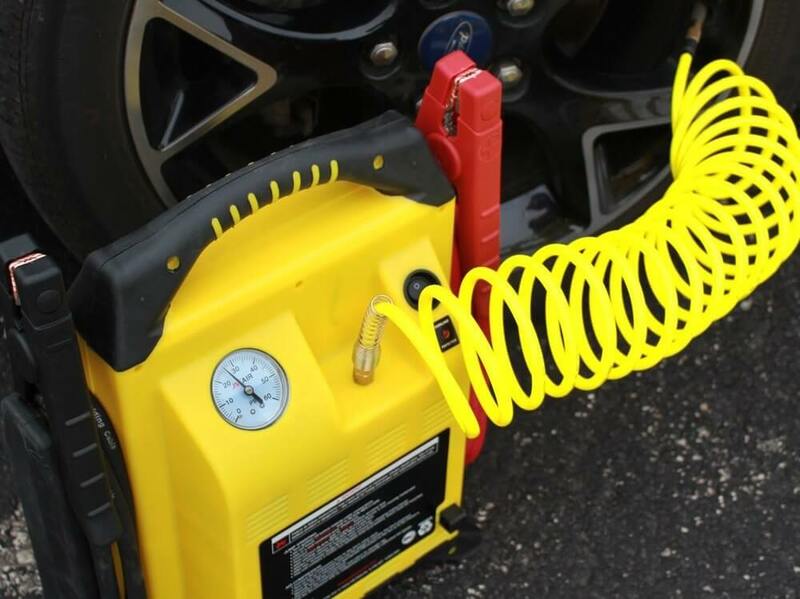 It is powerful enough to inflate tires or other equipment. It does not take much time to inflate a tire of a truck. The device has two simple mechanical gauges. It does not need any LCD displays. The first gauge shows the value of DC volts. It is located on the front. Another gauge is located on the back side and it shows pressure of the air compressor. 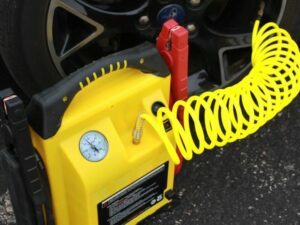 I have tested it and I should mention that it is powerful enough and it can inflate almost any kind of tires. Seals fit perfectly, so no air will come out. The clamps cords are long enough so you can connect everything without moving the starter close to an engine. It does not have USB ports or anything like that, but it is still a very good device and it does what it should do. 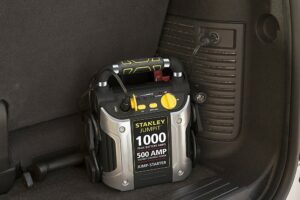 It should be mentioned that this starter has a special award – the best lithium ion jump starter. 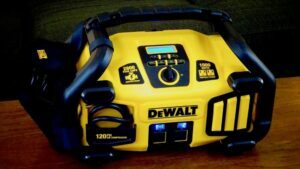 It means that it has a high-capacity battery, you can start up an engine with it without recharging it often. 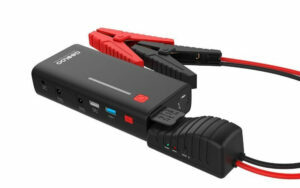 The battery is designed in accordance with modern technologies, which guarantees a high level of performance. 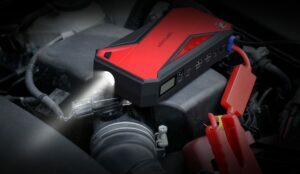 This is a very reliable device that is powerful enough to start different kind of engines, from small ones to the engines used in heavy-duty trucks. You can also start engines of motorcycles or boats. 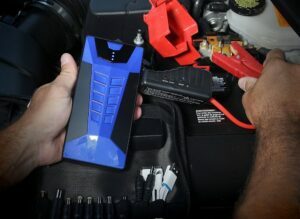 It does not have USB ports or an integrated flashlight, but it is still a high-performance device that can jump start an engine. The peak is 1700 amps. 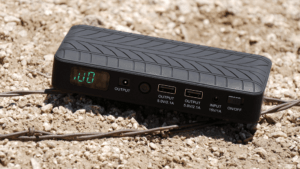 The battery capacity is 22 Amp Hour. That is quite high and it means that you do not need to recharge it too often. The clamps with long cords (68’’). The design of clamps guarantees they will not come off. The clamps are made of highly-durable metal, so they will serve you for a long time. The voltmeter that shows the battery charge level. 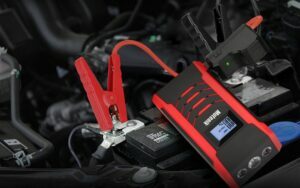 The special battery technology (“Performer”) assures high output of power and a long service life. The built-in charger. 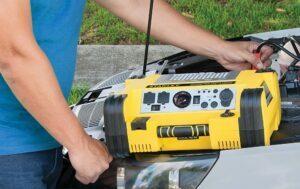 You do not need to use any kind of additional devices to charge the battery of this jump starter. The rubber boot makes it very stable. Since rubber is soft you can put it on plastic surfaces without damaging them. The rubber boot makes the device stand stable on uneven surfaces as well. A powerful air compressor. It has a special hose that can be connected shut without letting air come out. 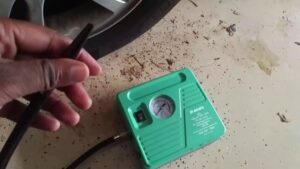 The compressor can be used to inflate tires ot other equipment. The weight is 28.5 pounds. The dimensions are 6 x 13.5 x 15 in. No USB ports. It can not be used to charge devices like tablets or laptops. No LED display that can provide you with important information. No flashlight. It is difficult to use this device in dark areas. 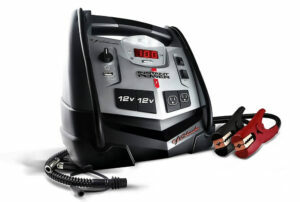 This is a very good device that can help you start up an engine. 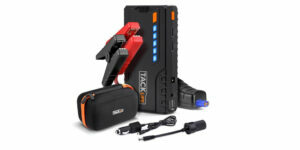 If you have an old car or your battery is not new then you should have this jump starter. 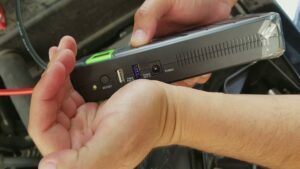 It does not have USB ports, to charge different devices, or a modern LCD display, but it does what it has to do – jump start an engine. Its power is enough to start up an engine of a truck. 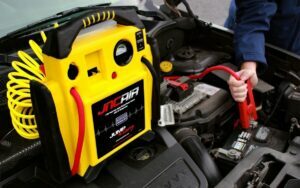 This jump starter has helped me many times. 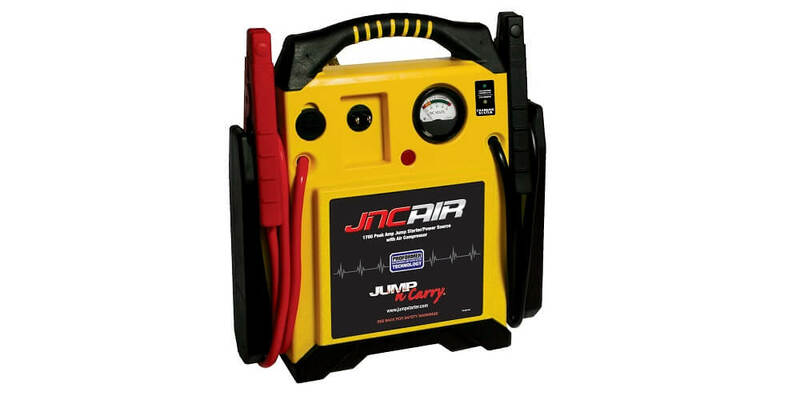 It performs two very important functions – starts up your engine and inflates your tires. Therefore, one device can solve two problems simultaneously. Of course, it is quite large and heavy, but if you have a heavy truck or a pickup truck, then you need to have this device. 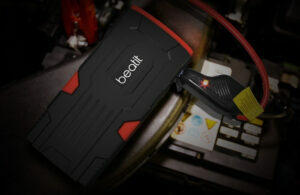 Remember that this device has our special award – “the best lithium ion jump starter”. 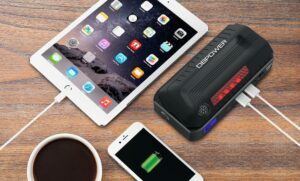 Therefore, it has a super reliable battery that does not require frequent recharging and it guarantees a high level of output. 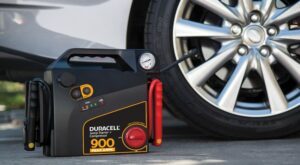 The battery was designed in accordance with modern technologies. 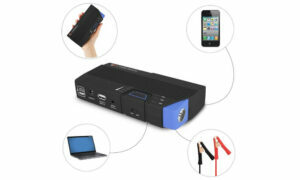 The battery is environment-friendly and it guarantees a high power output without losing charging over the time. 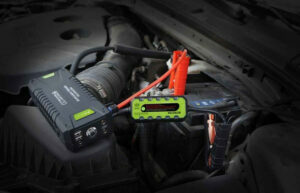 It is a super reliable device that drivers should have. It has two simple gauges that work perfectly, they just show you what you need to know. It has the most important elements only. The case is strong enough to withstand vibrations or any other kind of damages. The battery has a special case, so you should not worry that it will be damaged and the acid will leak out. It has a rubber boot that makes the device stand stable on uneven surfaces. It is quite heavy, but it has a handle that makes it easy to move around. Overall, it is a great device and I would like to recommend it every driver, especially if you plan to go outside towns.